It is a relatively quiet post-Carnival week for us but we are looking forward to heading to Sale with two nice horses on Wednesday; Suspicious Minds and Margin Trader. Having her first run since May, Suspicious Minds has been working nicely leading up to the De Bortoli Wines Handicap and we are looking for a bold showing from the consistent five-year-old. "She meets a small field (just eight rivals), "Michael Moroney noted, "and she can run well fresh." "She has performed well in a couple of jump outs and she is a stronger mare this time in." Still lightly raced, the daughter of Alamosa has won three of her 17 starts and whilst best suited over a bit more ground the 1400m is a good test for her first up. Meanwhile Margin Trader (pictured) has been shaping well this preparation and he strips fitter for his two recent runs, both of which have contained merit. Suited up to the 1717m of the Zilzie Handicap, the four-year-old still does a bit wrong but he "just keeps improving." 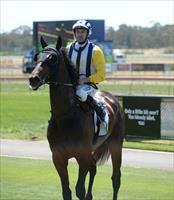 "He ran on very well last time but could've finished even closer if he had just gone a bit straighter," Moroney said. "But he is a talented horse and it is just a matter of him putting everything together." Jake Noonan takes the ride on both horses.